Original Art Studio: don't you just love a great big hug? don't you just love a great big hug? Wow! 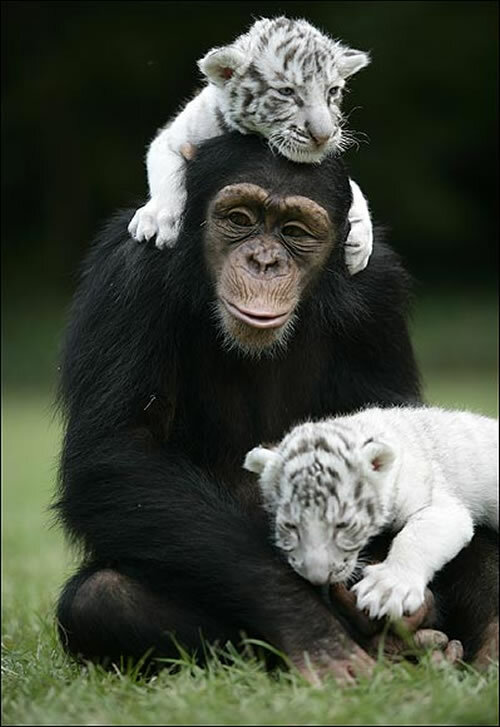 I can imagine cuddling up with a baby cub like that Chimpanzee. But to embrace a fully grown tiger? That guy's got confidence in his animal friend. Sounds like your Dad figured out what he had been witholding and missing out on. I'm so glad that you were able to finally experience the love he had for you by means of a hug - and your children too. Proof that we are able to change our ways at any age. Dan: I agree! Not so sure I'd be willing to risk giving the big one a hug. However, I am so deeply moved when I see those huge animals participate in an act of connection like that . . . it just melts my heart. Hugs need no words or translation that's for sure...and we all need them...the bigger the better...but I would prefer them from smaller animals! Wanda: Yes - you have to think twice when you see the size of those paws. Steven's amazing story of his father's learning and opening up IS a great big hug. And I'd rather find my hugs places other than in the arms (jaws?) of a tiger. That would be something! A hug you wouldn't soon forget! There is nothing ever better than a great big hug!!! Getting or giving!! Yes please, A hug would do just splendidly. Nobody should be without somebody to hug. An elderly lady whose husband had died a year earlier said to me, 'what I miss most is that there's nobody to hug now, just a hug in passing, just a quick, casual one now and again'. I've never forgotten and I will hug my husband, casually, whenever he happens to be within reach. What a good reminder. Our elderly are often touch-starved. Even if you can't, for some reason, hug them - try to touch their skin - their arm, their hand, their cheek. It is a fundamental human need to be touched. That just goes to show...We are all one. Hugs are good,but I am not so sure about being hugged by that huge tiger. So, I think I will just enjoy looking at the pictures. I can't help but think that second hug would scare me to death. I love hugs. They keep me "in touch" (no pun intended). I'd rather have a big hug over a kiss any day. such a sweet post...I so enjoyed! I'm a touchy/feely person to begin with, so when someone wants to hug me, I'm all for it! C'mon! I'm Italian! Bring it on! Kiss, kiss, hug, hug!